This course teaches System Administrators how to implement a cloud-computing environment using Red Hat Enterprise Linux OpenStack Platform, including installation, configuration, and maintenance. 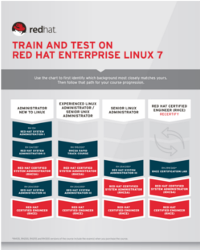 Through hands-on labs, you will explore manually installing each service of Red Hat Enterprise Linux OpenStack Platform, and will also look at the future plans of the OpenStack development community. This course will help you prepare for the Red Hat Certified System Administrator (RHCSA) in Red Hat OpenStack Exam (EX210). Deploy Red Hat Enterprise Linux OpenStack Platform using packstack. Create an instance with the Horizon web interface. Install and verify RabbitMQ message broker service. Install and troubleshoot Nova compute and controller services. Launch an instance to verify the new compute nodes. Install and troubleshoot the Heat orchestration service.